TDmonthly Magazine Products by DELTA ENTERPRISE CORP.
Products from DELTA ENTERPRISE CORP. Ideal for creating a full room for toddlers, this set includes easy-to-assemble pieces that form a bed with a sturdy steel frame and removable bedrails, a toy organizer and table and chairs. It is recommended for children ages 18 months to 5 years. The weight limit is 50 lbs. 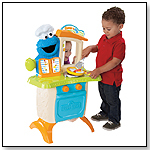 The toy organizer includes nine storage bins and is easy to clean. The table and chairs set is made of wood and MDF. This denim headboard has accent stitching in metallic silver and purple, plus rhinestone inlay and LED lights behind an appliqué guitar. Girls can connect their MP3 player to the dock and then listen to music through the two speakers and an amplified sub woofer. Launch date: Summer 2008. The seven-piece room décor collection includes two fabric bins, a music note door plaque, a primping station and three shelves. Launch date: November 2007. This innovative product features authentic NASCAR sounds and decals. Product features include adjustable height, four-wheel stability, a washable seat cushion, and interactive sounds and lights. 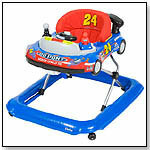 This walker is a must-have for the growing NASCAR fan base, and appeals to parents just as much as children. — “Its ‘car-like’ design and innovative NASCAR features allow it to stand out from its competition,” Jeff Meyer of Delta Children’s Products told TDmonthly. This is a long, low Toy Box Bench with three good sized, removable cloth bins for storage and a sturdy back for bench use. This "Cars" inspired piece holds tons of toys. Delta Enterprise introduces its ‘Tween Dollhouse Collection, a line of multifunctional furniture that turns girls' bedrooms into life-sized dollhouses. The standing bookcase features a slanted roof design and curtained “window” and “door” storage with multiple shelves. The bookcase matches all of the pink with white “lace” trim furniture pieces in the ‘Tween Dollhouse Collection, including the Desk with side drawer and computer storage compartment, Chair and Hutch, Headboard with shelves room, Night Table with drawer and cabinet; and Coat Rack Shelf. The bookshelf’s been available since January 2006. For the adventurer in every little girl, the Dora the Explorer Restickable Table & Chair set is sure to liven up imaginative play. Three pages of punch-out restickable decals can be used to create continually changing scenes and stories. The easily accessible toy-keep in the center of the table holds unused restickables, small playthings, art supplies, and any other secret treasure she might find. Table dimensions: 23.6"D x 17.3"H, Chair dimensions: 11.8"W x 11.8"D x 21.8"H.
— “It’s another Dora Christmas,” laughed Sara Kite, co-owner of Kites and More, Rockingham, N.C.
— “Dora is still strong this Christmas,” said Robert J. Beck, owner of Beck’s Toy Emporium in Minneapolis. — “This furniture set is a hot seller for us,” replied Van Mickelson, co-owner of Vanity Toys in Biloxi, Miss. 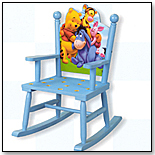 Direct from the Hundred Acre Woods, Winnie the Pooh and his friends Tigger, Eeyore and Piglet adorn this rocking chair. Decorating a toddler?s room is an opportunity to not only create an entertaining environment where children enjoy hours of fun, but also provide a comfortable and functional place where kids can store their toys, hang their clothing, shelve their books, and dream. And now, families are bringing the magical world of Disney into children?s rooms with the introduction of Delta Enterprise, Corp.?s new line of multi-functional toddler furniture featuring Disney?s most beloved characters: Mickey and Friends, Winnie the Pooh and Disney Princess. Parents will now be able to decorate their children?s bedrooms and playrooms with furniture and accessories festooned with the likenesses of SpongeBob SquarePants, Dora the Explorer and Blue?s Clues. Delta Enterprise Corp., a leading children?s furniture manufacturer, has a new line of toddler beds, tables, chairs, desks, toy chests, easels and more, each portraying the spirit of those popular Nickelodeon characters. Delta is also developing original themed furniture pieces inspired by The Wiggles, the group of Australian-born children?s entertainers who have become the rage around the globe. In addition, Delta continues to provide the exclusive Baby Snoopy infant furniture and accessories, as well as the Precious Moments Baby Collection. They are also introducing 2 new licenses in ToyFair 2004.